Geraldine Pember has been collecting fans for over 50 years. It all started in the 1960’s when her sister bought Geraldine her first fan for $1 at an estate sale in Santa Barbara and she was hooked. Since then, she has travelled extensively through the years with her late husband, Lyles, and she collected fans wherever they went. Living in Mendocino the last 20 years saw both of them very involved in the arts and she donated one of her fans tothe Kelley House Museum in Mendocino to augment their exhibit on The Frolic, a trading ship that ran aground in 1850. It’s a Chinese Mandarin Fan, to show visitors an example of fans exported to Europe from China in the 19th century. One of Geraldines’ many skills is asking famous people for their autograph on a fan. She would carry a blank fan with her in her purse, always prepared for that chance encounter! Some of the signatures are from Arnold Palmer, Angela Lansbury, Helen Hayes, Cesar Romero and Lady Bird Johnson to name just a few! Geraldine also has a great love and passion for gardening and was the first Charter Member of the Ruth Bancroft Gardens in Oakland. Sheis a member of the East Bay Fan Guild, Fan Circle International and the Fan Association of North America. As a friend once said: ‘She looks just the type to wave a featheryfan!’ And truly, a gentle breeze always surrounds this genteel lady. We are proud to call her ‘fan friend’. Getting Arnold Palmer's autograph in Savannah Georgia. 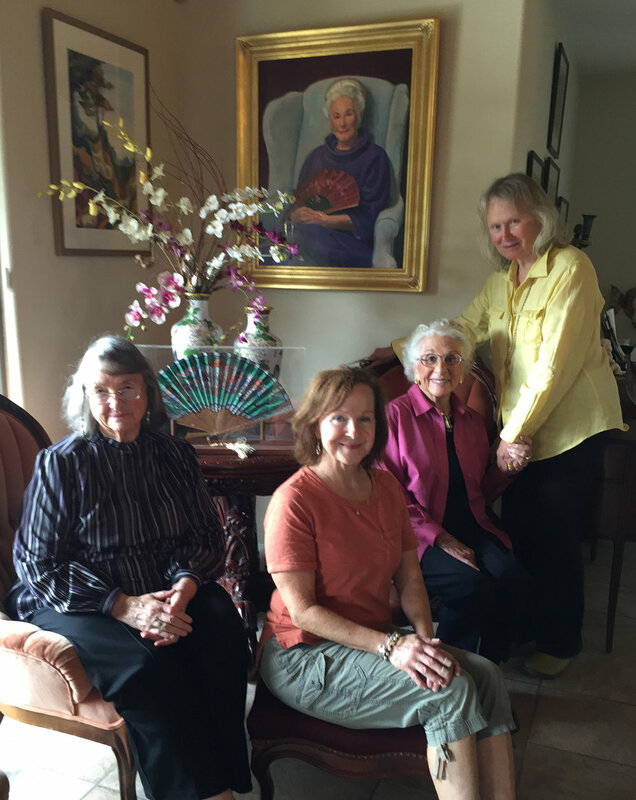 Left to right: Melana Eskew, Geraldine Pember, Arnold Palmer, Pam Sher. The Hand Fan Museum is fortunate to have a remarkable group of individuals who are dedicated to the mission of the museum.